Gabriel von Max (1840–1915), Go to Sleep! (1900), oil on canvas, dimensions not known, Private collection. Wikimedia Commons. In the first of this pair of articles looking at paintings in which monkeys or apes are a substantial part of the motif, I showed examples from over 3,500 years ago, and in each century from the 1400s up to the Age of Enlightenment in the 1700s. By the end of that century, many artists were attempting to portray animals and birds more faithfully to nature, in paintings which became increasingly objective (although the greatest emphasis on objectivity in painting was to come in the late nineteenth century in Naturalism). George Garrard (1760-1826), A Marmoset in Three Attitudes (1793), oil on panel, 38.1 x 48.9, Yale Center for British Art, New Haven, CT. Wikimedia Commons. 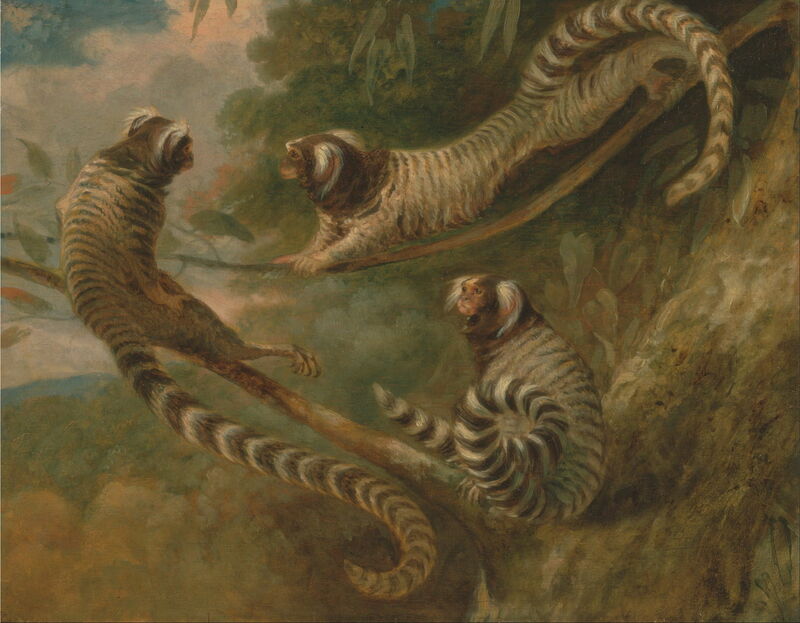 George Garrard’s A Marmoset in Three Attitudes from 1793 appears to have been intended for a reference description of the species, setting it in its natural habitat and in three postures which the artist took as being characteristic. Unlike later illustrations, though, this painting is painterly in the depiction of vegetation, and is by no means academic or dry. Edwin Henry Landseer’s approach in The Cat’s Paw from about 1824 is quite contrasting. This shows the moment of climax in a popular fable retold by Jean de La Fontaine in 1679, which probably originated in around 1560. Bertrand the monkey is roasting chestnuts in the embers of a fire. Rather than risk burning himself retrieving the nuts from the heat, he promises Raton the cat a share of them if the cat will scoop them out for him. The cat agrees: as Bertrand eats the chestnuts when they emerge fron the fire, the cat’s paw becomes more and more burned. Before the cat can claim its reward, they are disturbed by a maid. The monkey then profits from the cat’s efforts and suffering, but the cat is cheated from enjoying its share. This has entered the French language in the idiom tirer les marrons du feu, meaning to act as someone’s dupe, or to benefit from the work of others. In English, a cat’s paw is used figuratively of someone who is used by another as their tool. 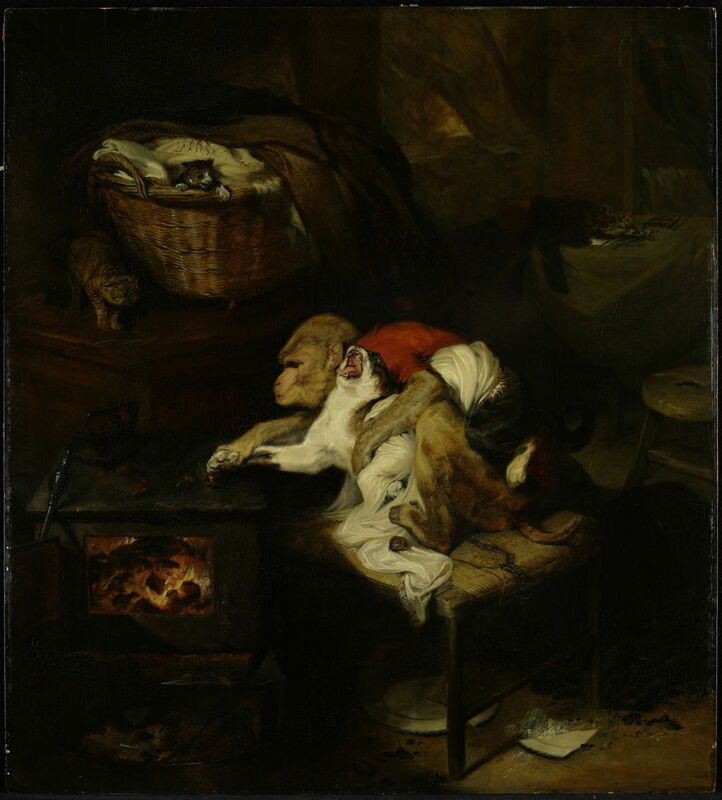 Zacharie Noterman (1820–1890), Monkey Business (date not known), oil on panel, 31.5 x 26 cm, location not known. Wikimedia Commons. By the latter half of the nineteenth century, when Darwin was busy unravelling the mysteries of evolution, singerie came back into vogue. 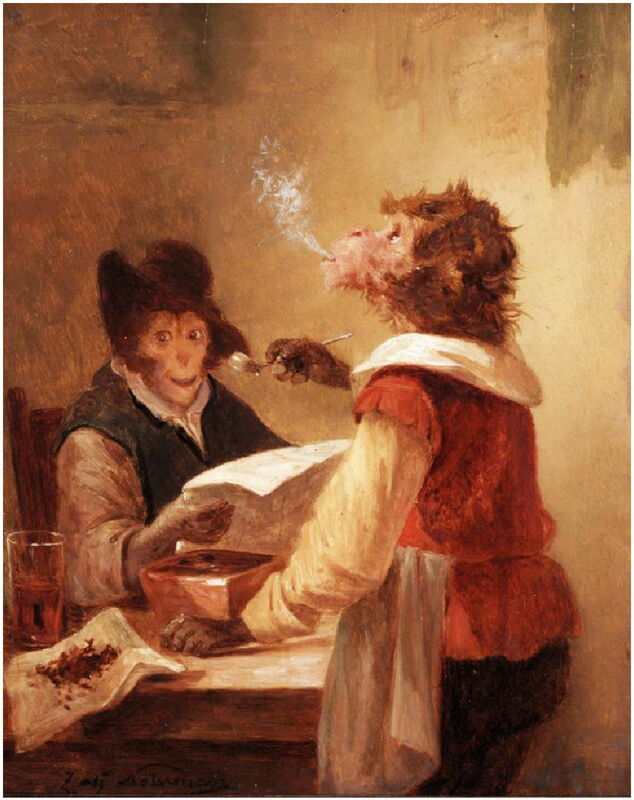 One of its exponents was Zacharie Noterman, who painted Monkey Business after about 1850. A monkey dressed as a businessman is plodding through his paperwork, as the bartender stands in front of him, smoking his clay pipe. 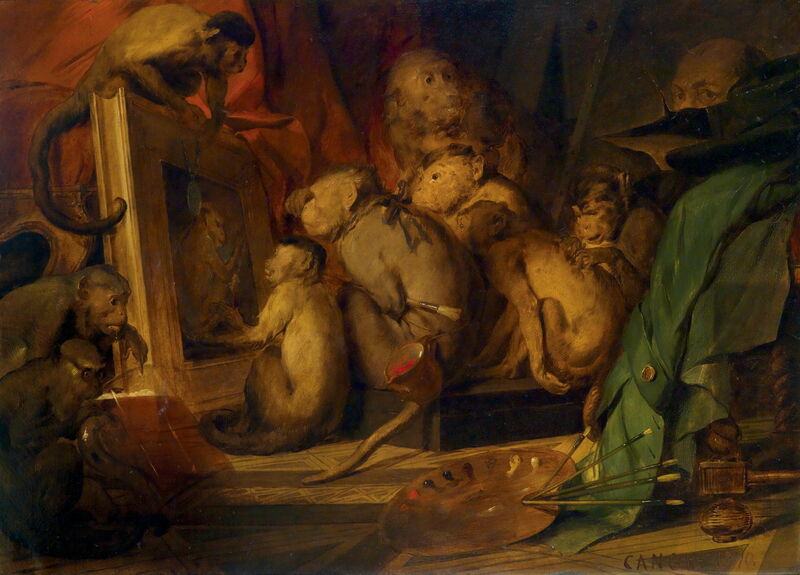 Monkeys became popular visual devices for those who wanted to criticise juries and organisers of art exhibitions for excluding their art, and showing members as monkeys is wicked satire. Hans Canon (1829–1885), African Jury Meeting (1870), oil on canvas, 104 x 143 cm, location not known. Wikimedia Commons. Hans Canon’s African Jury Meeting from 1870 makes just that comment about a jury which had apparently rejected the artist’s work. In the top right corner is the upper face of the artist himelf. For one or two artists, singeries were not enough. Gabriel von Max probably painted more works of monkeys or apes than any other artist, from models which he kept at his residence by Starnberger Lake, in the Bavarian countryside, where he painted each summer. Gabriel von Max (1840–1915), Monkeys as Judges of Art (1889), oil on canvas, 85 x 107 cm, Neue Pinakothek, Munich, Germany. Wikimedia Commons. 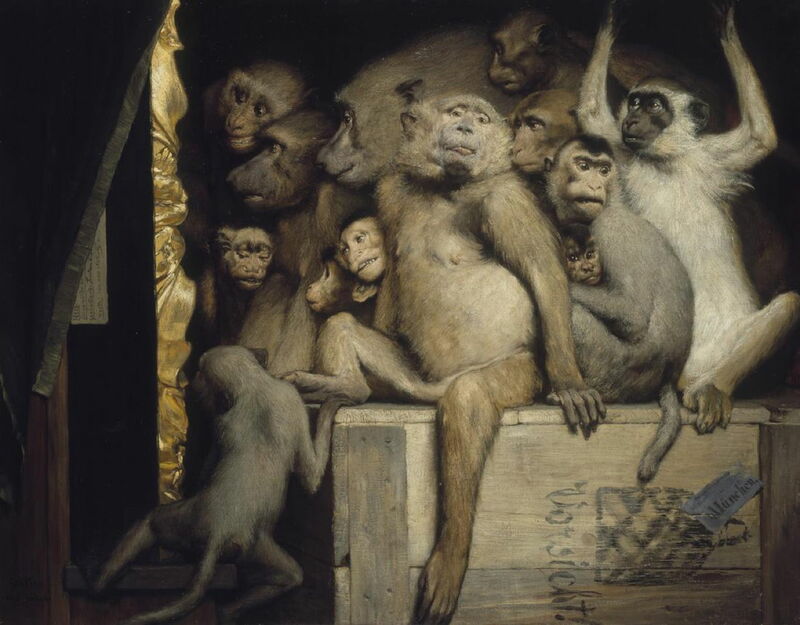 In von Max’s Monkeys as Judges of Art (1889), a crowd of monkeys are packed together in front of a canvas which already has a gilded frame, and will shortly be announcing their decision on that work. The artist avoids anthropomorphism, and his monkeys look very natural and non-human. Gabriel von Max (1840–1915), A Visit to the Artist’s Studio (date not known), oil on canvas, 88 х 124 cm, location not known. Wikimedia Commons. 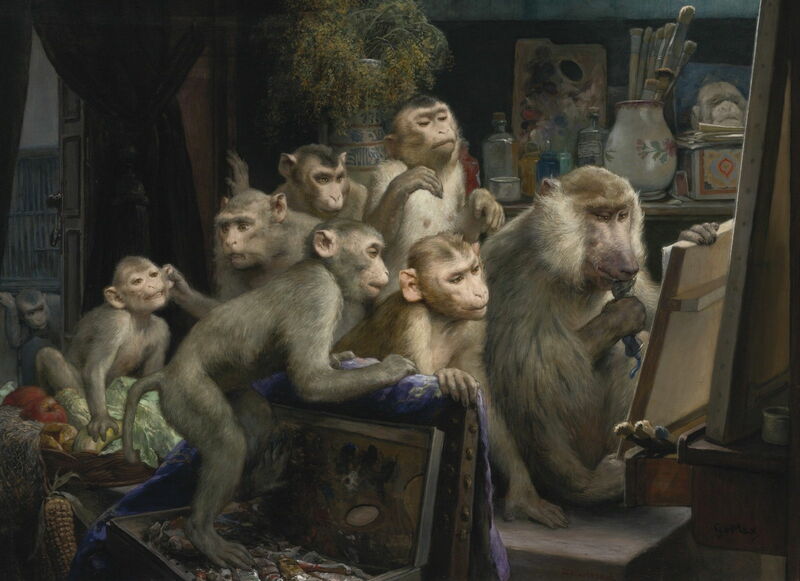 His undated A Visit to the Artist’s Studio shows a similar group of monkeys watching their leader handle von Max’s paint and brushes in his studio. I suspect that the artist may have supplemented his sketches of the group with some photos, as it appears implausible for the monkeys to have remained in much the same positions for long. Von Max appears to have had very tender and personal relationships with his monkeys. In Go to Sleep! 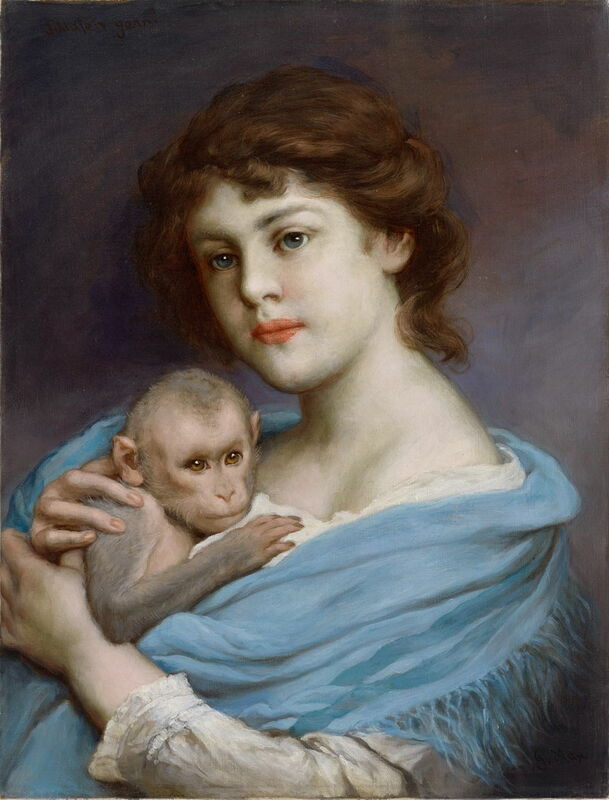 from 1900, a young woman, possibly his daughter, is nursing an infant monkey who is staring with tired eyes into the distance. Charles Darwin’s book The Descent of Man had been published in 1871, so by this time von Max would have been well aware of the proposal that monkeys and humans had common ancestors. Gabriel von Max (1840–1915), Self-Portrait with Monkey (1910), further details not known. Wikimedia Commons. 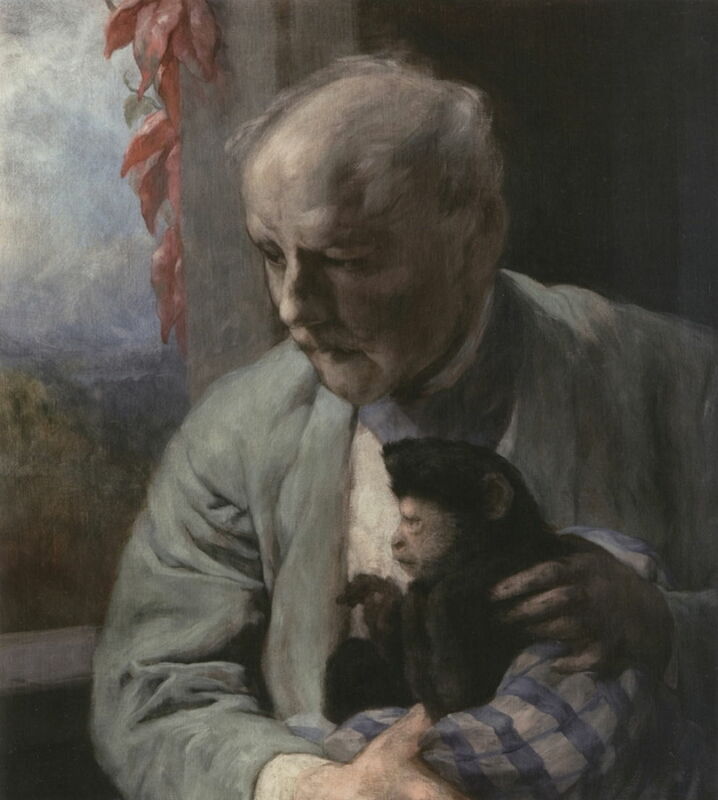 Von Max’s Self-Portrait with Monkey (1910) at the age of seventy shows him with another young ape. Monkeys have had other more symbolic associations, typically with mischief and mayhem. 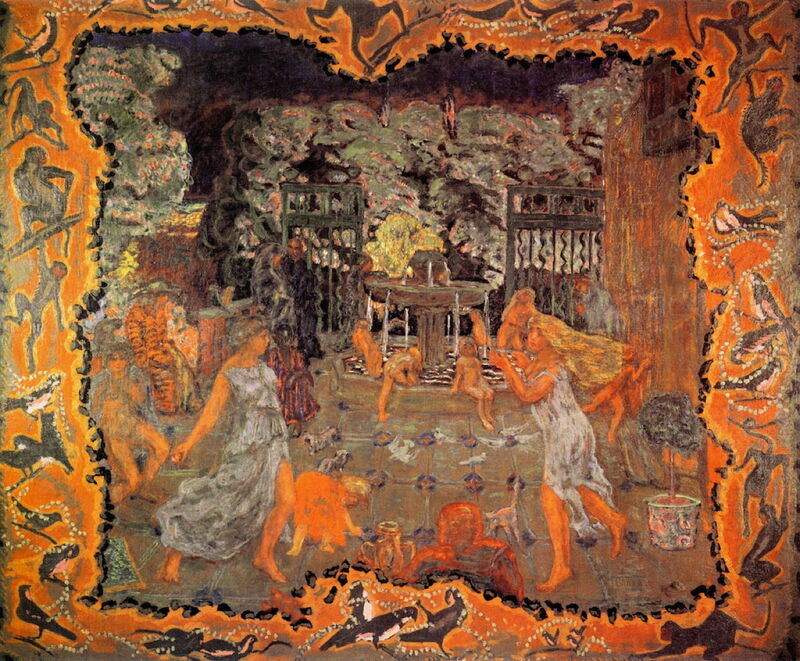 In Pierre Bonnard’s large painting of Pleasure or Games from 1906, one of four panels he made for Misia and Alfred Edwards’ apartment in Paris, decorative edging includes images of birds and monkeys, whose innocent playfulness is seen as being pleasurable. 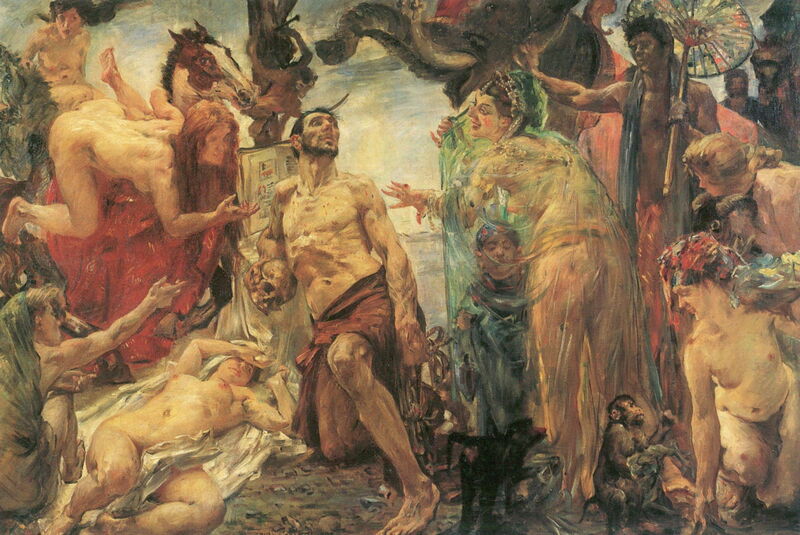 One monkey appears in the riotous assembly shown in Lovis Corinth’s painting of The Temptation of Saint Anthony from 1908. This radically different depiction of this episode in the saint’s life was painted after Gustave Flaubert, and exceptionally shows Anthony as a young man – a highly inventive account. Darwin’s theory may have been good for science and human understanding, but its effects have not been so good for monkeys. With acceptance of their close relationship to humans, monkeys, particularly chimpanzees, became surrogates for humans in experimentation. Martin Monnickendam (1874–1943), Professor L. Bolk’s Anatomy Lesson (1925), media not known, 171 x 171 cm, Amsterdam Museum, Amsterdam, The Netherlands. Wikimedia Commons. 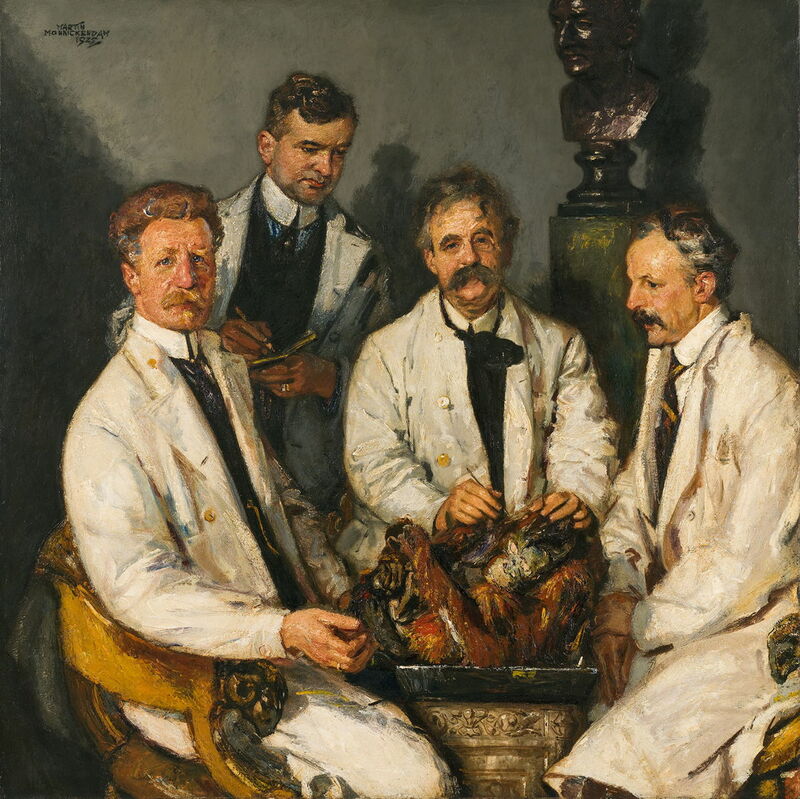 Martin Monnickendam’s disturbing painting of Professor L. Bolk’s Anatomy Lesson from 1925 shows a group portrait of anatomists dissecting the body of a chimpanzee. 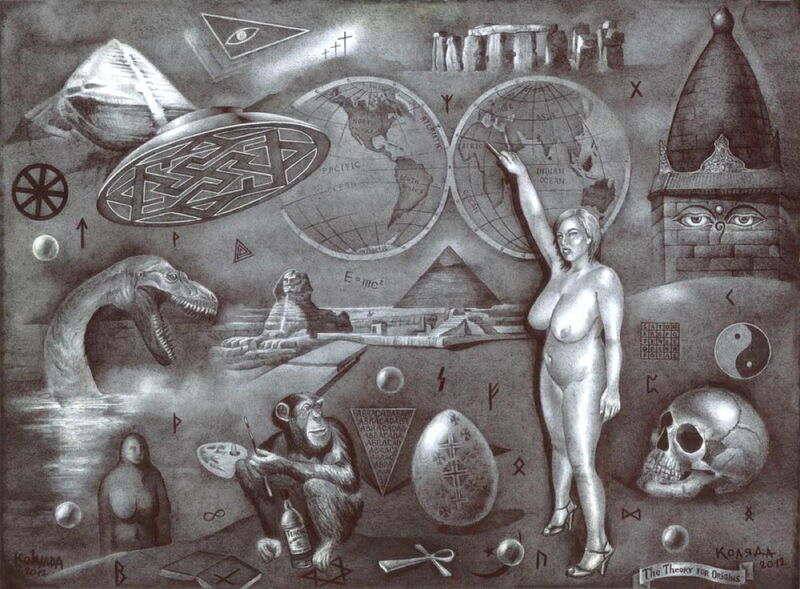 Serhiy Kolyada (b 1972), The Theory of Origins (2012), ballpoint pen on paper, dimensions and location not known. Courtesy of and © Serhiy Kolyada, via Wikimedia Commons. A painting monkey perhaps a commentary of contemporary art? Protective of its bottle of Teacher’s whisky and looking over its shoulder at a naked Teacher pointing to the supposed “cradle-of-civilization” Africa on a world map; both Teachers providing pupils with an escape? Or knowledge? An Egyptian pyramid, Stonehenge, Mount Kailish, the Temple of Tibet, a UFO and dinosaur, Sator Arepo and yin-&-yang all tease but fail to appease. Puzzles, a Bible, equations and runes add to the confusion, offering no real explanation except to say: Maybe Origin Theories are a mess and human beings have no idea, in fact, of their origins on this planet. Our closest relatives certainly have a lot to say in our paintings. Posted in General, Life, Painting and tagged ape, Bonnard, Canon, Corinth, Garrard, history of painting, Kolyada, Landseer, monkey, Monnickendam, Noterman, painting, singerie, von Max. Bookmark the permalink.